Income Chargeable at rates prescribed by Finance Act provided it comes within Scope of Total Income under Section 5 and it is not exempt under Section 10. Incidence of Tax depends upon a person's Residential Status and also upon the Place and Time of Accrual or Receipt of Income. Under this option, NRI can offer income from Specified Assets at Special rates of taxation and all other income under normal provisions of Income-tax Act, 1961. Treated as a separate block of Income chargeable to tax at special rates. The benefit of basic exemption of Rs. 200,000 for F.Y. 2013-14. All income other than income from specified assets is to be offered for taxation, as per the prevailing slab rates. Here, the NRI will have to declare interest, capital gains, rental income and any other income and claim deductions for expenditure, allowance, set-off of losses suffered in previous years and also basic exemption of Rs. 2,00,000 for F.Y. 2013-14. The total tax liability shall consist of tax under (I) and (II) put together. NRI can opt for consolidating Income from Specified Assets and other income and offer it for taxation. Here, he shall declare his consolidated Income together and he can claim deductions for expenditure, allowance, set-off of losses suffered in previous years and also basic exemption of Rs. 2,00,000/-. NRI must compute his income under both the alternatives, quantify the tax liability and select the alternative where tax liability is least. If an Individual who satisfies both the understated conditions of section 6 of the Income-tax Act, then he becomes a Non-Resident. If a person, who is citizen of India, leaves India for employment outside India or as a member of the crew of an Indian ship. In other words, the above categorized persons are non-resident if they satisfy condition 1 alone. 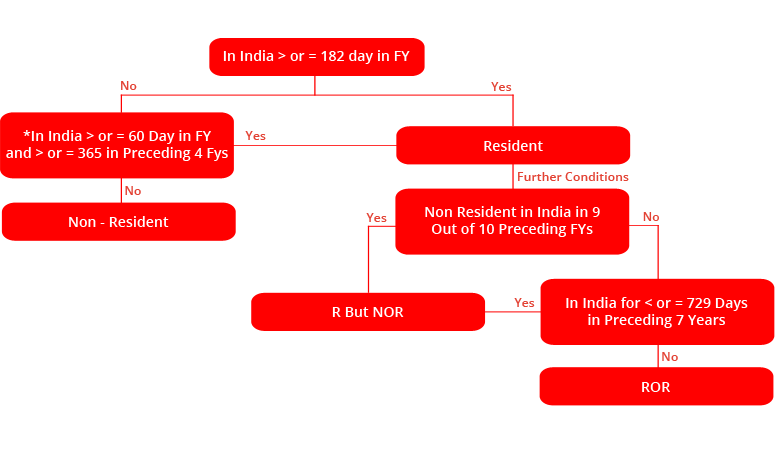 Note: A person who is returning to India after 9 years of stay outside India (and who was non-resident for each of the 9 years under the Income Tax Act, 1961), shall remain RNOR for the period of two years only. Taxable period is the termed as Previous Year i.e. the period starting from 1st April to 31st March wherein the income has actually been earned by the person. Number of days stay in India during this period is to be counted. Day of Arrival into India and the Day of Departure from India are counted as 1 day each in India (i.e. 2 days stay in India). Dates stamped on Passport are normally considered as proof of departure from and arrival in India. The stay in India is to be counted on the basis of physical stay of a person. In the 1st year of leaving India for Employment, one shall leave before September 28th so that the person is a NRI for the said FY. Otherwise his total income (including foreign income) in the year of leaving India, is taxable in India. An NRI, returning to India for good, should generally try and come back on or after February 1 (or February 2 in case of a leap year) so as to maintain his residential status of NRI. However, if your stay in India in prior 4 previous years does not exceed 365 days then one may return after 2nd October (or October 3rd in case of a leap year). In both the cases, you will remain non-resident for that financial year (i.e. April-March) ensuring your income earned outside India is non-taxable in India for that financial year. The Double Tax Avoidance Agreement (DTAA) is essentially a bilateral agreement entered into between two countries. The provisions of DTAA override the general provisions of taxing statute of a particular country. With the insertion of Sec. 90(2) in the Indian Income-tax Act, Non-Residents have an option of choosing to be governed either by the provisions of a particular DTAA or the provisions of the Income-tax Act, whichever is more beneficial. Interest on NRO FD is subject to a tax deduction at source at the rate of 30.90% if DTAA benefit is not allowed. There are different beneficial lower rate of tax on Interest prescribed for different countries which usually ranges from 10% to 15%. As per Finance Act 2013, a Person shall not be entitled to claim any benefit of relief under DTAA unless he furnishes a Tax Residency Certificate (TRC) to Deductor. Further, the Act also specifies that along with TRC, a Person has to produce other documents and information as prescribed by Central Government to avail the benefit of DTAA (e.g. Declaration in Form NO.10F). Income Totally Exempt From Tax For Non Residents. Section 10(4)(ii) : Interest on Non Resident External Account (NRE). OCBs are not eligible for exemption under this section. Section 32(1)(aa) of the UTI Act : Income from units of UTI acquired in foreign exchange or from NRE account/FCNR account by Indian citizen / person of Indian origin. Section 10(15) : Interest, premium on redemption and other payment on notified securities, bonds, certificates and deposits. Section 10 (15) (iv)(fa) : Interest paid by a schedule bank to non-resident or to a person who is not ordinarily resident on RBI approved foreign currency deposits i.e. FCNR & RFC deposits and Interest earned by OCBs on FCNR deposits. The exemption, in respect of RFC account, continues till such time as the account holder continues to be RNOR. Section 10(33)/ 10(34) : Dividends earned on shares of the Companies and Income on distribution from units of Unit Trust of India / Mutual Funds. Section 47(viia) : If eligible foreign currency Bonds or Shares/GDR of Indian company issued under GDR scheme are transferred outside India, by one non-resident to another non-resident then capital gains arising on such transfer is exempt from Income-tax. Taxability of wealth, as per Section 6 of the Wealth Tax Act, 1957 is based on one s Residential Status and citizenship in India. Basic exemption limit of rupees Rs. 30 Lacs and thereafter flat 1% rate. Assets acquired by him out of money referred to in (a) and (c) within one year prior to the date of his return and at any time thereafter. Income earned from any source in India is taxable in India. Any other income earned or received in India is taxable in India. Income other than the above is not taxable in India. A person, who is resident and ordinarily resident in India (ROR), is liable to pay tax in India on his world income. Why Filing Your Return Is Important ? Income from Short Term Capital Gains on equity shares or units of equity oriented mutual fund. Income from Long Term Capital Gains, which are chargeable to tax. The tax deductible at source has been deducted from such income. Hence, if an NRI has only Investment Income or Long Term Capital Gains or both (only from foreign exchange assets, as explained above) and the tax has also been deducted at source from such income, then he is not required to file his Return of income for that relevant Financial Year. It is however recommendatory for NRIs to file their Return of Income in India as the tax deduction at source for NRI is prescribed at maximum rate as per Income-tax Act. However, the actual liability to tax for the year computed in accordance with the provisions of the Act is generally lower. * Plus applicable "Education Cess" (2%) tax and "Secondary and Higher Education Cess (1%). NRIs are entitled to claim exemption from the tax if they reinvest long term capital gains /net sale consideration into certain specified assets. Section 194IA, a newly inserted section, mandates a person to deduct Tax at Source (TDS) @ 1% while paying consideration for buying any Immovable property other than rural agricultural land in India to any resident seller/builder. The said provisions are applicable where the transaction value is more than Rs. 50 lacs. Also, the given provisions have become a concern while buying and paying any amount for underdeveloped plot or under construction apartment/villa etc from Builders. This amendment has taken effect from 1st June, 2013. Further in case if the builder does not provide Permanent Account Number (PAN) to the buyer, then the buyer has to deduct TDS at higher rate i.e. at the rate of 20%. Tax Exemption Certificate (TEC) is an order of Assessing Officer issued under provisions of section 195(2), 195(3) or 197 of Income-tax Act 1961. The rate prescribed for TDS from NRI's income is the maximum rate of tax at which relevant Income is taxable in India. However, in majority of the cases of NRI, the actual tax liability is lower than this. Also, the higher deduction of tax so made is generally not claimed as refund by filing Return of Income. In order to assist in such situations, the Income-tax Act has provided procedure under section 197 whereby a NRI can apply to the Assessing officer to issue specific certificate authorizing the payer of income (who deducts tax at highest prescribed rate) to deduct tax at a lower rate or nil rate as the case may be. Such a certificate would be binding on the payer and he shall deduct tax in accordance with the certificate of the Assessing officer. Thus whenever a persons actual tax liability as per the provisions of Income-tax Act is lower than the tax deducted at source he may apply for Tax Exemption Certificate. Permanent Account Number (PAN) is a ten-digit alphanumeric identifier, issued by Income Tax Department to each assessee (e.g. individual, firm, company etc.). Permanent Account Number (PAN) is mandatory for transacting in financial markets in India. PAN enables the department to link all transactions of the person with the department. A person is required to quote his PAN while executing many transactions in India, for example opening NRO bank account, investment in shares, mutual funds, filing return of income, property deals, vehicle deals, investment in bank FDs. Although as per rules of Income-tax Act, 1961, PAN is not mandatory for non residents, but there is requirement to furnish to Income Tax Department, registrar and other parties who makes payment to non residents on which payer is liable to deduct tax. Rate of TDS actually to be deducted i.e. 10% (DTAA rate for Interest Income in certain countries) or 15% (certain Short Term Capital Gains) or 30% (other Incomes) etc. In view of above it is advisable for Non Residents to obtain PAN.